Uniform: Class A only please! Please wear formal Class A Uniforms! This is THE formal event of the year! It's 3 events in 1! 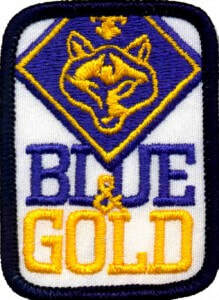 Blue and Gold Banquet - the annual Blue & Gold banquet is a tribute to the anniversary of Cub Scouting. We'll begin the night at 6pm with a meal, and go over some scouting history and origins. Arrow of Light Ceremony - the Arrow of Light is the highest award in Cub Scouting. It is awarded to those Cub Scouts who have successfully completed the requirements of the Webelos rank. This award is significant in the Scouting experience, and so significant that it's the only Cub Scout badge that is permitted to be worn on the Boy Scout uniform. This special ceremony recognizes the tremendous efforts and dedication by the Webelo II scouts. Crossover Ceremony - for those Arrow of Light recipients who are continuing on to Boy Scouts, Pack 62 will salute you and bid you farewell as you cross over the bridge and officially become a Boy Scout. These scouts will be welcomed and greeted by scouts and leaders in their chosen Boy Scout Troops, as they each embark on new adventures. Join us as we honor the achievements of our 5th graders, share dinner together, and send our boys off to Boy Scouts with a hearty salute. Dinner will be served. Thank you to the Webelo II parents for the catering. Webelo II scouts - invite your family and definitely bring your camera to this ceremony celebrating your Cub Scouting achievements!